Filled with humor and bittersweet emotion, the series finale of Friends finds Rachel, Monica, Phoebe, Joey, Chandler and Ross embarking on the next chapters in their lives. The six of them have been there for each other through all the ups and downs of becoming adults. Now it's their last day together, a day of momentous events and last-minute surprises. Even as the friends make major decisions on their futures, there is a bond between them that will last forever - no matter where their paths lead. So it comes down to this. After 10 years, Friends has its last hurrah with its series Finale, a double-length episode that ties up some loose ends. 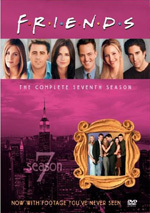 Before Rachel (Jennifer Aniston) leaves for Paris, she and Ross (David Schwimmer) engage in one more night of passion. Ross interprets this as a sign they should get back together, but Rachel just looks at it as a nice goodbye. Surrogate mother Erica (Anna Faris) is having a baby for Chandler (Matthew Perry) and Monica (Courtney Cox-Arquette). She goes into labor early, so the pair need to rush her to the hospital. Erica gives birth, which results in some surprises. The episode watches their reaction to newfound parenthood and their plans to move to the suburbs as well as the conclusion of the Ross/Rachel saga. As for Joey (Matt LeBlanc) and Phoebe (Lisa Kudrow), they’re just along for the ride. Although I used to watch Friends regularly, I fell off the bandwagon a couple of years ago. Because of that, I must some confusion as I went into the Finale. One can figure out the different bits without too much trouble, though. Granted, I never learned why Rachel’s going to Paris, but I deciphered that Mike’s dating Phoebe and that Emma is Rachel’s daughter. 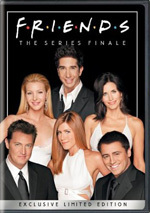 Friends: The Series Finale appears in an aspect ratio of approximately 1.33:1 on this single-sided, double-layered DVD; due to those dimensions, the image has not been enhanced for 16X9 televisions. Folks who’ve seen prior Friends releases will find similar visuals for the Finale. As usual, sharpness seemed somewhat inconsistent. Most of the time I felt the show came across as reasonably detailed and distinctive. Unfortunately, some examples of softness occurred, and the show looked somewhat ill defined at times. Occasional examples of jagged edges and moiré effects occurred, and I also noticed some edge enhancement. In regard to source flaws, a couple of specks popped up, but that was it. Colors worked well. The show presented nicely vivid and bright tones, and the DVD replicated them concisely. Blacks also seemed firm and rich than in the past, and shadows were reasonably distinctive and not too dense. The episode didn’t dazzle, but it mostly looked fine. Whereas the other Friends DVDs offered Dolby Digital 5.0 audio, the Finale went just with the original Dolby Surround 2.0. Not that anyone will notice a difference, as the scope and quality remained virtually identical to the 5.0 renditions. Dialogue dominated the episodes and remained oriented toward the front center. As always, music presented solid stereo presence over the front speakers, and the surrounds echoed the tunes moderately. The rear speakers added nice ambience at the airport, but otherwise they remained rather passive. A few extras fill out the DVD. Two versions of the Finale itself appear: the Broadcast cut and the Extended take. The latter lasts about two and a half minutes longer than the former, though it makes some changes in addition to the extra footage. 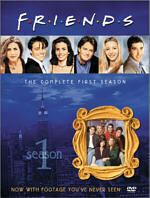 For example, the “Broadcast” episode starts with a “previously on Friends” prologue that fails to appear in the “Extended” cut. To remind us of where the show began, we get the series Pilot. Here we see how the gang came together. Actually, we don’t learn the whole genesis of their friendship, as five of the six characters already hung out together, but we do learn how Rachel came to reunite with high-school buddy Monica and then became part of the crew. On her wedding day, Rachel chickens out and leaves hubby-to-be Barry at the altar. She tracks down former friend Monica because she doesn’t know anyone else in Manhattan. Ross also deals with the collapse of his marriage; his wife Carol realized she’s a lesbian, and Ross moves into a new place. Monica goes out with Paul the Wine Guy, who lies to her to get her into bed. The “Pilot” isn’t a bad episode, but it seems rough and awkward compared to later shows. It also stands out negatively in regard to its continuity. Later in the series - as demonstrated in “The One Where Ross Finds Out” from Season Two - it becomes an important plot point that Rachel never knew that Ross had the hots for her. However, at the end of the pilot, he tells her that he used to have a crush on her and then inquires if he could later ask her out on a date. As we’ll see at the end of Season One, the show does try to pooh-pooh this original statement, but I didn’t buy it. Anyway, although this is the “Pilot”’s third DVD appearance, it’s a good addition to this set. 10 Years of Beginnings lets us watch the opening credit sequence for all 10 seasons of Friends. Behold as the cast ages and changes in front of our very eyes! All snottiness aside, this is a cool feature, as it’s fun to recap 10 years of Friends in seven minutes and 24 seconds. Finally, we get the music video for “I’ll Be There For You” by the Rembrandts. An alternate version of the show’s title theme, this video already appeared on Best of Friends Volumes 1 & 2. The cast cavort on the set of the video shoot and ham it up with band members. It’s a cutesy affair that is more fun if you like the show, but it still got on my nerves. I liked Friends and feel sad to see it go. The Finale ends its very successful run with a program that manages to touch all the appropriate buttons. It wraps up storylines succinctly and tosses in enough humor and sentimentality to make it a good show. The DVD looks and sounds like its predecessors, as the picture seemed generally positive and the audio was average. The extras add a few minor components to the mix. Although the DVD did its job, I find it hard to recommend just because it doesn’t present a lot of value. Even if we count the “Pilot”, it only includes two shows, and it seems likely most fans will already own the first episode elsewhere. From what I understand, this DVD is the only place where the broadcast cut of the Finale will appear, but that doesn’t seem like a strong reason to get it. (Future releases should solely include the extended version.) At the current pace, Season Ten of Friends should be out on DVD within a year, and I think it makes more sense to wait until then.